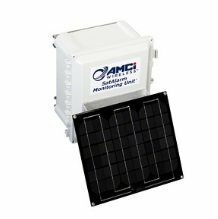 AMCI's MeterEye® is a revolutionary turn-key solution for remotely monitoring meters that were not designed for telemetry. The MeterEye simply and non-invasively captures an image of the face of the meter. The image is wirelessly delivered to a Web site where it is stored and converted to digital data. The stored images and data can be viewed, reports run and graphs displayed, and alarms configured using just a Web browser. AMCi's MeterEye eliminates the need for regular visits to the meter to verify readings that would normally need to be checked, as the resulting time/date-stamped images are true verification, and can be accessed from the customers password protected Web site.